Thanksgiving weekend is a big deal in the US. A time to be with families, and to give thanks for everything you have. We got back from our first trip back from the UK since moving, to find that it was only a couple of weeks away. After failing to get out of bed to do a permanent 200 randonnee the previous weekend, we started to work out what to do over the four day weekend. It seemed like the ideal opportunity to take out the new ExtraWheel trailer on Dobbin for a bit of touring. We originally planned to do a loop of the bay area, but a couple of days before, had a change of plan and decided to cut it a bit shorter. After a minor house maintenance problem we set out just gone 11am Thanksgiving Thursday, on quiet roads heading towards Joseph D Grant County Park. A mere 25 miles as the crow flies, but about 500m higher than our house. It lies about a third of the way up Mount Hamilton, a climb we had yet to try - we haven’t spent much time exploring the hills in the East Bay, as generally it means cycling through San Jose first whereas the Santa Cruz mountains and Los Altos hills are on our doorstep. Cycling through American suburbia we could smell roast turkey, roast potatoes, and all the other delights of the traditional Thanksgiving meal. It was a beautiful day though, and we were just glad to be out cycling in shorts and short sleeve tops in late November. We soon came to the base of the climb and started seeing some of the cyclists who had ridden the last of this year’s low key hill climbs descending back to the start. We soon settled into a rhythm, spinning very slowly up towards the campsite, towing trailer and camping kit as we climbed. The views across the south bay soon opened up beside us beneath the clear blue sky. For someone who used to hate climbing hills, it’s surprising how much I enjoy this sort of climb while touring. No time pressure, a wonderful view to enjoy, a peaceful road. Although the gate at the entrance to the park was unmanned, and the campground hosts seemed to have left for the season, we managed to find a ranger and buy a box of wood to be delivered to our site. We had a small walk out to Grant lake before the sun went down. There seems to be a number of nice trails in the park, to explore another time. The air was very cool out of the sun, and with the clear sky it was going to be a cold night. Well wrapped up in jumpers and hats, we sat and watched the fire while eating our unconventional Thanksgiving supper of pasta and sauce with crunchy vegetables (I didn't plan them that way, we just didn't want to wait any longer as it was cold and the stove was nearly out of gas). The only turkeys in sight were the wild ones roaming the park. Even though we were only a few miles from a huge conurbation, with the park in a dip over the first ridge line it was very quiet, and the stars were out in force with a gibbous moon. Friday morning dawned cold and with a heavy dew. We had both woken up before dawn with eerie howling echoing around the valley - from coyotes I presume. Despite being close to San Jose, the park has an abundance of wildlife. On our way out of the park to continue our climb up Mount Hamilton we surprised a wild boar rooting by the side of the road. I’m not sure who was more shocked, it or us! After our enjoyable climb the day before we decided to change our original plan of heading back down to the valley and along to the base of Mount Diablo, and instead to climb over Mount Hamilton and see where we ended up. One of the best bits of touring is the ability to change plans and go wherever the road leads you. The day had yet to warm up, and view across the valley was very clear. After a couple hours of climb the road started to get busier, with a number of motorbikes passing us and also enjoying the open roads. At the top of the climb is the Lick Observatory are a number of telescopes belonging to the University of California. The view is pretty amazing. We hadn't researched this route at all, so weren't sure what to expect on the road down the other side. 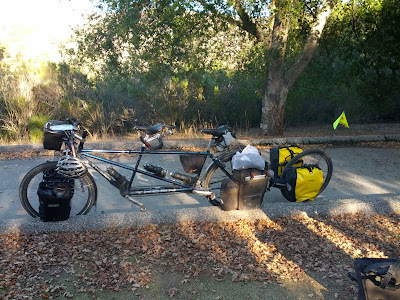 It turned out to be a pretty good decent, but relatively technical on a fully loaded tandem with trailer, although the trailer made very little impact on the handling of the bike. After about 14km, the road flattened out in a remote feeling valley. Even though there has been a fair amount of rain in the last few weeks in the bay area, the creeks and ponds were mostly dry here. After a while, the road turned north into another valley. We were surprised to find ourselves passing the end of Del Puerto Canyon road, and realised that we were now on the route of the permanent randonnee we hadn’t started the week before. I vaguely recalled that there were a couple of small climbs before we started the main descent into the Tri Valley, but they were a little larger than I recalled - the first was around 200m ascent. The main descent was shallow, but enabled us to keep up a good pace. We had realised that there was no way that we were going to make it up Mount Diablo that day, and decided to just head into Livermore and find a motel. The base of the valley was signalled with many vineyards and seemed to us to have a very French feel. With France in mind, our thoughts turned to food. Plates of thin bloody steak with hot crispy fries were appealing, but we were hungry enough to just go to a chinese takeaway close to the motel. They did a family deal, which was too much of a challenge for two hungry cyclists to refuse. It turned out to be too much even for us for one meal. Fortunately the motel room had a fridge and a microwave so the leftover chow mein, chilly beef, pepper chicken etc was eaten for breakfast. With our original touring plans in tatters, we set out for a gentle ride to Anthony Chabot regional park. Once more, we decided to avoid the worst of the holiday traffic and take the scenic route via San Ramon. Having not originally planned to stay at this campsite, we weren’t sure how to approach it. The vehicle park entrance was some way out of Castro Valley, and there were a number of bikes trails along the lake which also had access. While looking for one of these trails, a local out walking stopped to ask if we needed directions. It turned out that the park entrance was at the top of a climb, and the campsite was significantly higher than the lake. After a climb which seemed to go on for a lot longer the promised mile, and having been passed multiple times by the same motorbike who seemed to be enjoying racing up and down it, we reached the turnoff for the campground. We were surprised to find that the road kept to the ridgeline for a couple of miles before finally dropping down a couple hundred meters to the campsite. While it was much busier than the Joseph Grant campground, there was still plenty of space and we soon found a spot which wasn’t too exposed, and had a nice flat area for the tent. Many spaces seemed to be more suitable for RV’s, with not enough flat ground to make it good for tents. We had stopped in San Ramon to buy our supper - rib-eye steak, and a bottle of red wine. With the black beans and mashed potatoes we already had in our panniers, we were in for a feast. The campfire was soon burning in preparation for for a pair of steaks. 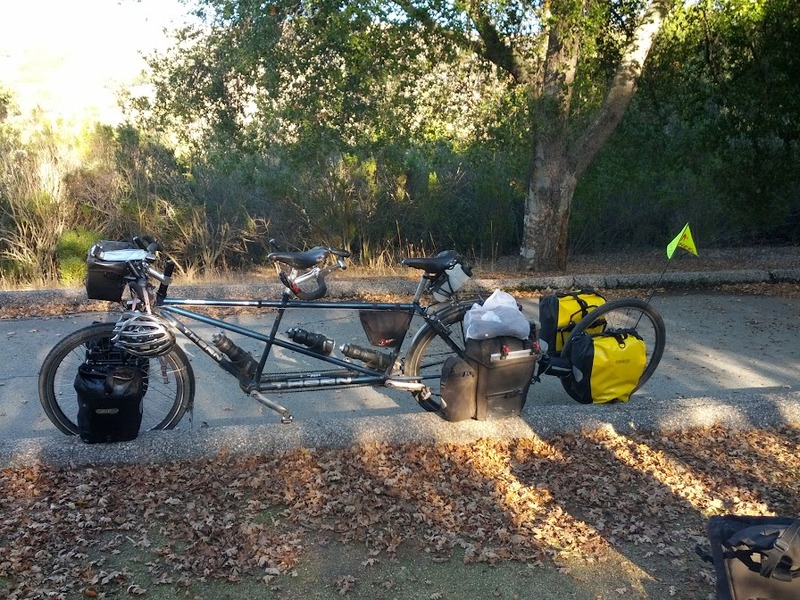 For a cycle camping meal, it has to have been our most decadent, and highly enjoyable. As we were at a lower altitude and nearer the bay, it wasn’t too cold outside which meant we could watch the fire burn low. There were lights from a number of bay settlements visible from our picnic bench, and while there was some traffic noise. It was a good campground nonetheless. Sunday morning was arrived with the shock sounds of rain: first time in the tour! Turned out just to be that a SF bay mist had creeped in overnight, and condensing on the trees was enough to send drops down onto our tent. The day’s journey began with a steep dirt trail down to Lake Chabot shoreline. Again, the trailer worked excellently, following behind faithfully on the slippery mud and rock trail. The rest of the morning consisted of winding through East bay suburbs of Hayward and Union City, before reaching the ponds before Dumbarton bridge. It felt somewhat bleak there, halfway out into the bay in the mist, but once across the bridge and heading into Palo Alto, we soon saw our first glimpses of the sun for the day, and by the time we reached the sign welcoming us home to Sunnyvale, waterproofs had fully given way to short sleeves and sunshades once more! All in all, a wonderful tour and a great reminder of all we love about cycle touring.